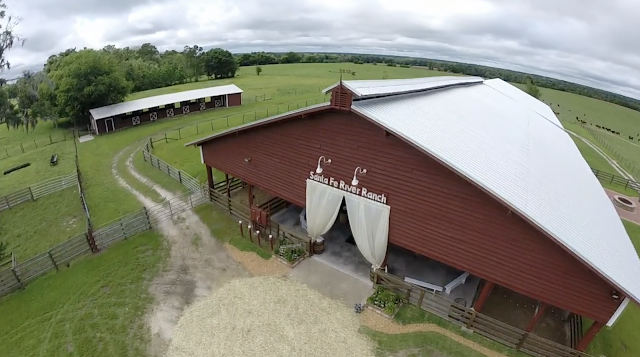 Just outside of Gainesville, Florida, is an extraordinary wedding venue / ranch, called the Santa Fe River Ranch. We have found ourselves filming there more than any other venue recently and are booked well into the future with SFRR weddings. So we wanted to give a shout out to one of our most favorite local venues and share some of our wedding films that show just how awesome of a wedding venue and wedding reception venue, that the Santa Fe River Ranch actually is, (see our drone shot above). When we met with Thomas and Elizabeth at CYM Coffee Shop, they told us that they had seen our work and that they wanted us to make them their own Disney Love Story Movie. I'm always up for a challenge and so we talked about what Elizabeth especially liked, where the wedding was going to be, Sweetwater Branch Inn, and what we were going to do.